My husband and I have traveled to various cities in the United States and abroad. When planning our vacations and once we have arrived in a city, maps are one of the items we have found most useful. I hope these maps will help you as you plan your visit and during your stay in Chicago. To access a large, interactive version of a map, click on the links. There are more than 100 hotels in the downtown Chicago area! 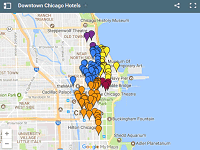 Whether you'll be spending time on the Museum Campus (Adler Planetarium, The Field Museum, Shedd Aquarium), heading to an NFL game or concert at Soldier Field, relaxing along the Chicago Lakefront, exploring the Chicago Riverwalk, or shopping The Mag Mile, use this map to find a hotel that fits your travel plans. Chicago has more than 50 museums! You will find well-known and well-advertised museums, and you may also find some that are new to you. Check out this map and start planning your visit today! Visit the Museums page for more museum information. Knowing where restrooms are located is important not only to tourists but also to residents who are spending a day out enjoying the city. In Chicago, many businesses, especially restaurants, post signs restricting restroom use to customers. If you don’t want to make a purchase, what can you do? 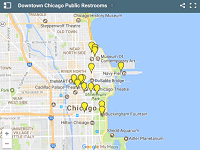 Use this map to find a public restroom in downtown Chicago. Spending the day outdoors in Lincoln Park, perhaps taking a free guided tour of the Alfred Caldwell Lily Pool, walking around the North Pond Nature Sanctuary, or spending the day picnicking? 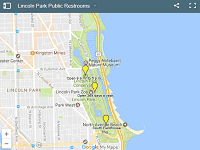 Use this map to find a public restroom in this area of Chicago's Lincoln Park. With more than 580 stations, Divvy, Chicago's bike share system, is a great way to make your way around Chicago. Divvy's daily passes are great for visitors and people who ride infrequently. Riders who live in the area and bike frequently will save money with an annual Divvy membership. 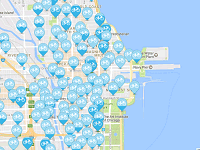 Use the Divvy station map to find bikes near you. Visit the Divvy website to learn more about the bike share program. Chicago offers a wide range of venues offering live blues performances. From the multistage Kingston Mines offering blues performances every night of the week to restaurants offering blues brunches on the weekends, you are sure to find something to fit your style and schedule. 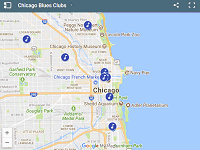 Use this map to find a venue featuring live blues performances in Chicago. If you love live jazz, you will find plenty of options in Chicago. Venues range from the Green Mill, which offers live jazz every day of the week, to smaller bars and restaurants offering live jazz performances a few times each month. 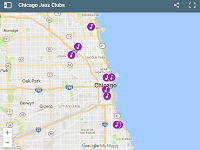 Whether you're in town visiting or a resident, use this map to find a venue featuring live jazz performances in Chicago. Whether you exercise because you love the way you feel after a good workout or because you know it is a vital part of living a healthy lifestyle, you probably have found that fitness club memberships and individual classes can be expensive. 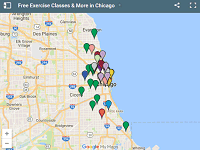 Use this map to find free exercise classes, group fun runs, and more in Chicago. For additional information, visit the Free Exercise Classes & More page. If you are a visitor or resident abroad, your country's consulate general is where to go when you need assistance. Some are open limited hours or require an appointment, so be sure to review the consulate general's website or call before visiting the physical location. Also, due to building security, visitors may need to be registered to be granted access to upper floors. Use this map to find a consulate general in Chicago. Honorary consular officers perform consular services on a part-time basis and usually have full-time employment in addition to part-time consular duties. For that reason, many of the honorary consulate addresses listed will be the officer’s full-time employer or the officer’s home. Please call or email to make an appointment before going to the locations. Use this map to find an honorary consulate in Chicago.